Fleur de Feu #142 (meaning Flower of Fire) is one of those makeup products that makes me feel like a grown up. Being in my mid-twenties, I guess I should feel like a grown up anyways, but this luxurious lipstick just has a certain je ne sais quoi that is sophisticated. elegant. classy. It is my first Guerlain lipstick, which I purchased in my quest for the perfect spring coral lip. 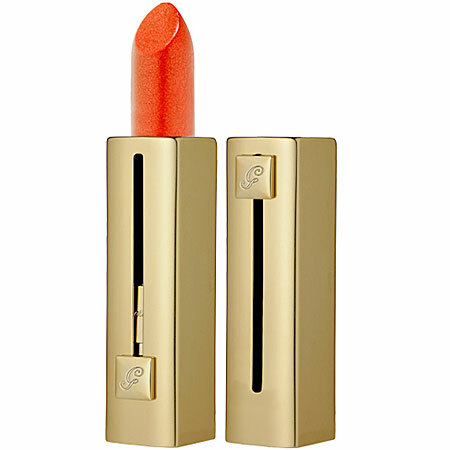 While this shade doesn't exactly meet those requirements (more orangey than coral) and it doesn't really suit my skin tone (more on that later), it is undeniably a stunner. First things first, though...I am not a fan of the packaging. As you can see in the picture above, the lipstick bullet pops up from the canister with the help of a sliding mechanism (when the lipstick is down, there is a lid that covers it which then slides away when you use the product). Something about the square shape of the container makes it feel a bit cumbersome and bulky when actually applying the lipstick. But if you can get around that, the gold packaging and engraved 'G' looks luxe. The lipstick does have a scent, so you may wish to avoid it if such things bother you. To me, though, it smells like...lipstick. In reality, the scent is a floral of some sort, but it just reminds me of how lipstick traditionally smells (a bit old lady-ish, but I dig that). 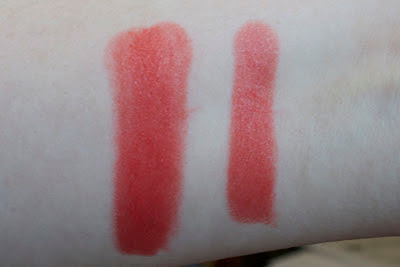 The real beauty of Guerlain Rouge Automatiques, however, is how smooth and creamy they are. This bad boy applies incredibly easily, no doubt due to it's rich texture, and it feels hydrating on my lips. It has excellent pigmentation and a definite sheen, and it doesn't seem to settle into fine lines. It's lasting power is good as far as lipsticks go (it stays a lot longer than more sheer lippies, like Dior Addicts or Chanel Rouge Coco Shines, but not as long as stains, like the YSL Glossy Stains). The only major pitfall of this particular lipstick is that while I am obsessed with the color--it completely fits in with the color of 2012: Tangerine Tango and it makes me excited for spring--but it just doesn't suit my very cool skin, which is currently hovering around NW15. I'm going to hang on to Fleur de Feu and see how it works on me during the summer months, when I have a bit more color. In the meantime, I think I will also check out a couple of other Rouge Automatiques in similar coral-y shades (like #143 Nahema or #141 Quand Vient L'Été) to see if they suit me a bit better. If you are looking to add to your lipstick collection, particularly if this is your first foray into higher-end lipsticks, Guerlain Rouge Automatiques would make a lovely introduction. While this is my first (and as of now, only) shade, Guerlain RAs, as they are known, are reputed to be some of the best in the business. They cost USD $35 and can be purchased at a wide range of retailers, including Sephora and Nordstrom.